Kua and Teariki dream of starting a small bakery. The very day they have scheduled a meeting at the bank, all the islanders are shocked by news that Moruroa next door might collapse, creating a Tsunami of 10-20 meters. Kua and Teariki are in love and will soon be married. 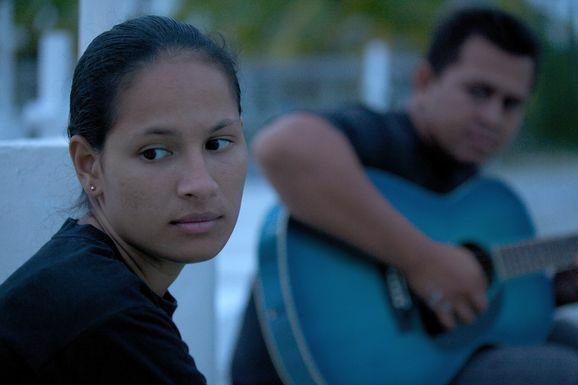 They are a young couple in their 20s living on the remote island of Tureia in French Polynesia, South Pacific. They have a small child, Maoki. Recently they have learned that his little heart is not well. They wonder if this is an effect of living only 100 km from Moruroa, where France has tested 193 nuclear bombs during 30 years. Seven people in Teariki’s family have cancer; one of them is his father Maro. Being a child during the years of atmospheric testing he has like many others on the island developed thyroid cancer. The French authorities knew that children were the most vulnerable to radiation, but never was any information given. One time Maro got bored waiting in the shelter for the French to do whatever they were doing over on Moruroa…. He simply went fishing, and when it was discovered that he was missing the nuclear test was put on hold… Helicopters and boats were searching for Maro until he was found, returned to the shelter and a bomb 200 times larger than Hiroshima could be blasted off into the atmosphere. Vive la France is a personal and intimate story about harvesting the consequences of the French nuclear program 1966 - 1996. Through the love story and everyday life of Kua and Teariki and their extended family in four generations we tell a very urgent and highly moving story where the place you love and belong to turns into your worst nightmare. The characters move the story forward and become our guides. Through their lives a complex and abstract reality becomes something we can understand and feel, a drama about our vulnerability as human beings. The imagery is poignant and vivid, following the events as they happen. Unexpectedly there is a great deal of humour. Pariscience International Science Film Festival - Award: Won jury award.